Having a stack of anytime notecards around is always handy. 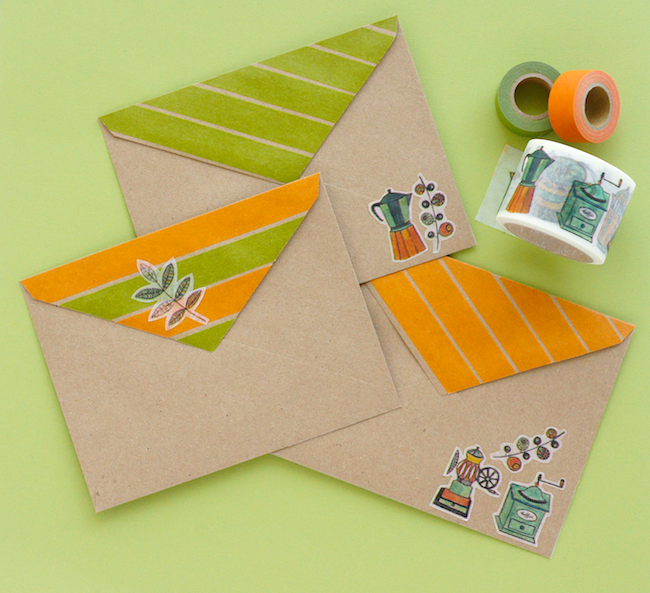 With a little bit of time and a bit of washi tape, you can whip up your own to keep on hand. I love this coffee lover tape with its midcentury modern motifs and colour palette because it is pretty neutral, and I do try to avoid imposing my predisposition for pink on everyone. 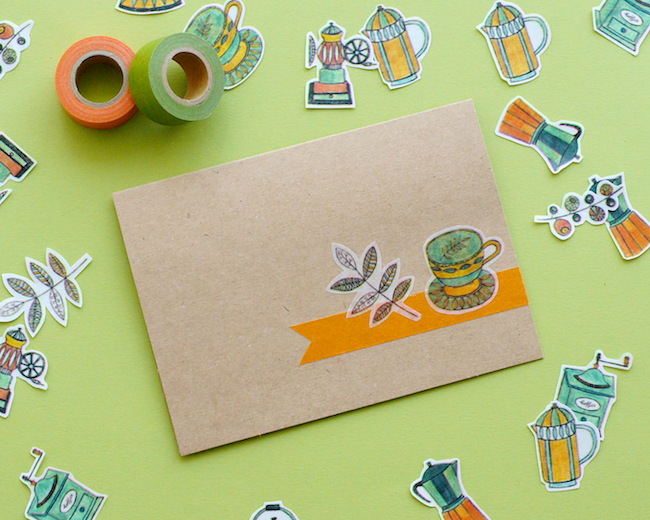 Start by transforming a few strips of your tape into stickers. On a side note - A kind reader left a note yesterday that she had found making stickers with waxed paper difficult - I would love to know what you use for creating stickers out of tape. I usually use the backing papers from our shipping labels but have also used parchment paper and waxed paper before with success. Usually, you will find one side of the paper works better than the other - this can take a little trial and error. 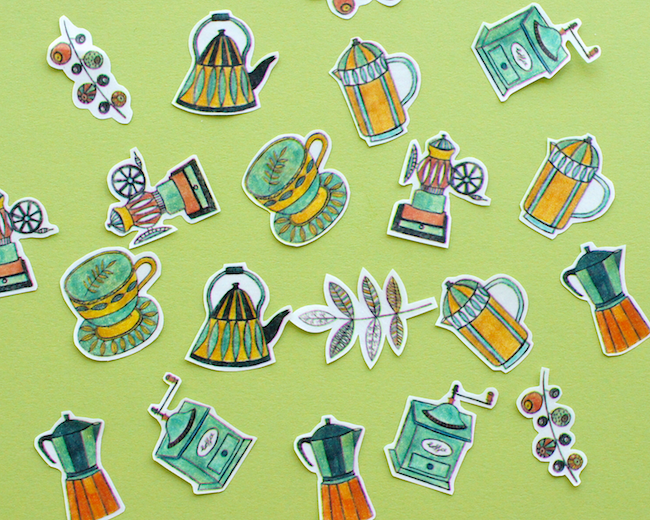 Try one or two stickers and ensure you can peel them off the backing before committing to making a whole lot of them. 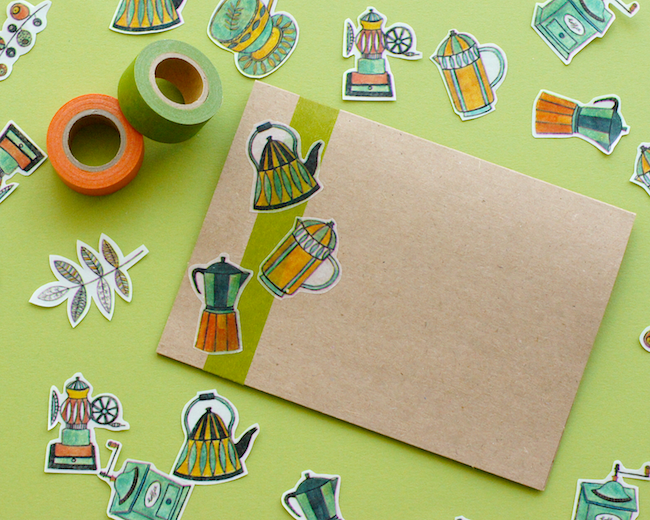 Combine the stickers with strips of solid or patterned tapes into whatever arrangement you please. Pretty cute, right? And perfect for saying hello or inviting someone for a cup of coffee and a chat. 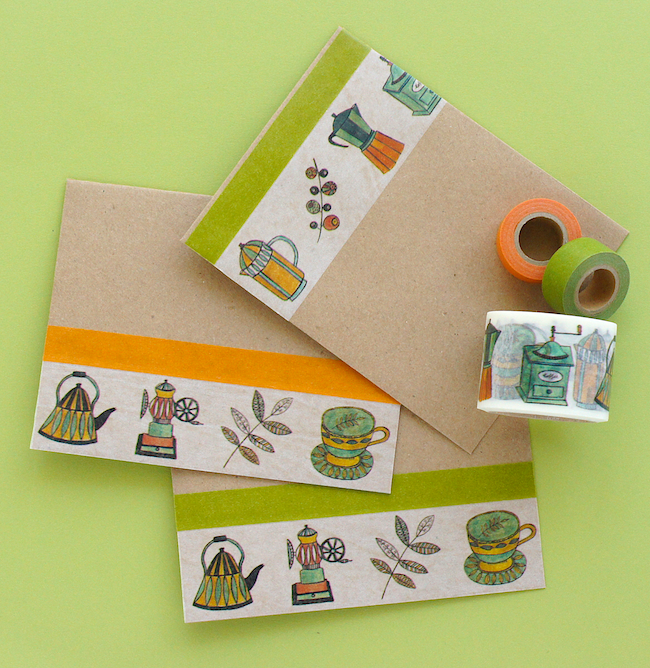 Don't forget the envelopes - try running a strip of your illustrated tape along one side. And add a little excitement to the backs too. 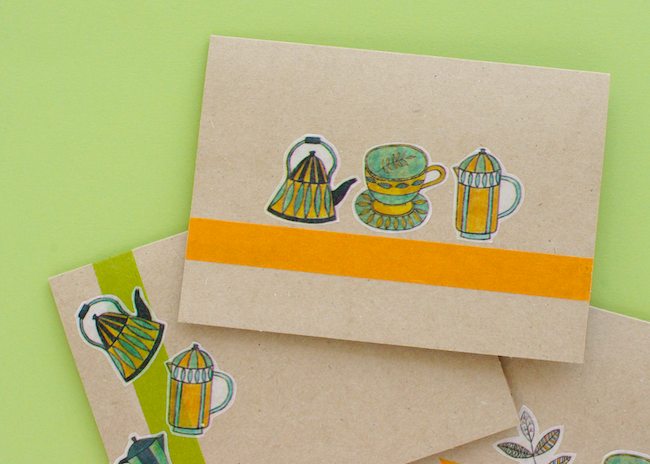 I do love a good washi striped flap! 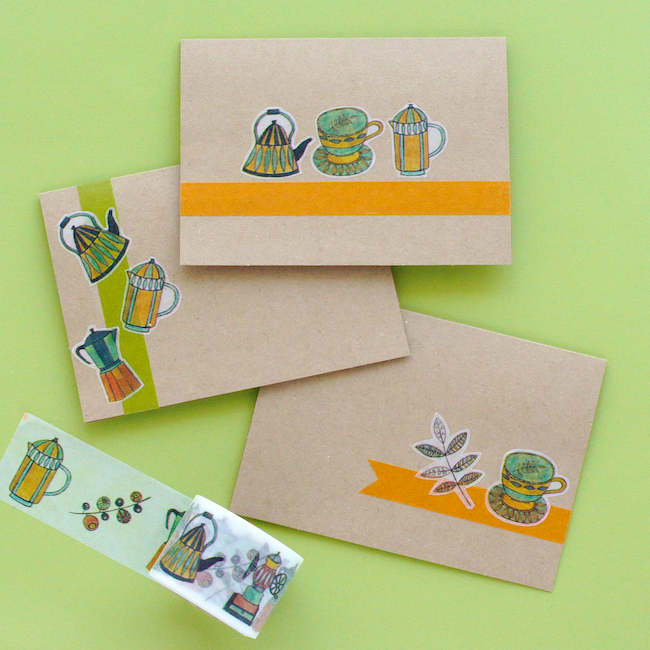 Have you sent any pretty mail lately? 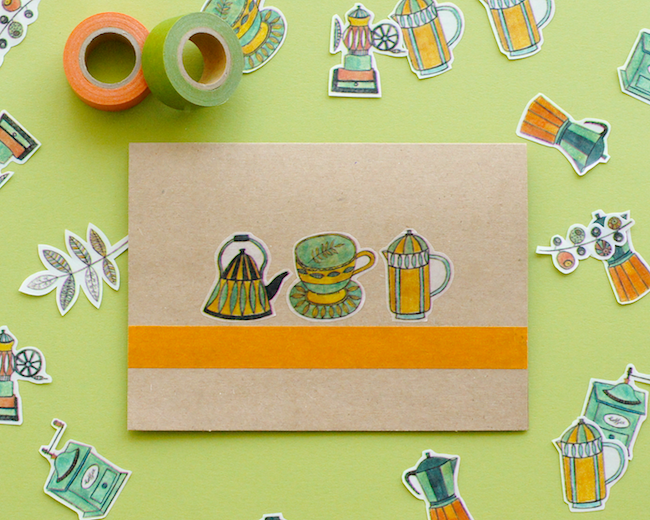 I'd love to see your washi tape cards & envelopes. Dear OMIYAGE, i discovered your blog lately and it's awesome! thank you for providing such a great source of inspiration. To answer your question about creating stickers out of tape -- i usually roll the tape out on a cutting mat (keeping the roll intact, do not cut off the length of tape yet). With a penknife or something spiffier if you have, carefully trace out the desired pattern on the tape. the roll can then be lifted easily to remove the length of tape, trim off where needed. the cutouts can then be lifted with the knife blade and transferred to wherever you like. Hope this helps! I love these coffee cards. You have done pretty good work with printed tapes. Loves your work. Keep it up.